Welcome to the Nigeria realtor referral network. If you're looking for an opportunity to make EXTRA money from Nigeria real estate, you have come to the right place. 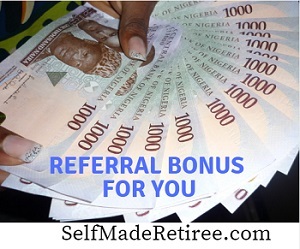 How does this Nigeria real estate referral network work? Simply introduce the properties in our portfolio to your spouse, friend, work colleague or anyone else you know and encourage them to buy from our portfolio of high profile estates. When they buy from us, we pay you a juicy bonus for introducing them to us. How Big Is The Real Estate Bonus? How Much Can You Earn? The sales bonus our realtor referral network pay to people who refer buyers to us is 10% to 15% of the property price. For example, land at one of our estate sells for 2,500,000 Naira per plot. The real estate sales bonus for this particular estate is 15% of the property price. 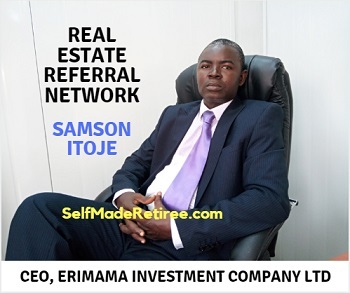 This means that if the client you refer to this real estate network buys one plot of land from this particular estate, you will be paid a sales bonus of =N=375,000. If he or she buys 3 plots, you will earn a bonus of =N=1,125,000.00 from that transaction. A plot of land in one of our PREMIUM estate is =N=12 million per plot. The property sales bonus for this particular estate is 10% of the property price. This means that if you refer a client to our network who buys one plot of land from this estate, you will be paid a bonus of =N=1,200,000 for that transaction. If the client you refer buy 3 plots from this particular estate, you will earn a bonus of =N=3,600,000 from the transaction. You could become a millionaire from a single transaction! To qualify to earn sales bonus from our realtor referral network, you must be a registered member (or registered consultant) with our real estate referral network. Step 1: Take the consultant training. This training teaches you the basics of the real estate consulting business and how to close deals. Option 1: Live one-on-one coaching at our office in Lagos (or via Skype). And at a time agreed with YOU. Option 2: Do It Yourself. This option gives you the opportunity to buy the training manual and read it yourself. This option allows you to get the same training at half the price. Option 2 Cost: Buy the training manual for =N=4,500 (instead of =N=9,000 for the live training). P.S: You will get immediate access to download the training manual once your payment is confirmed.